The weekend of August 28-29 was the inaugural weekend for the Wolverine Cup. The plan for the weekend was to get the family together and travel the west side of Michigan to play at different Disc Golf courses and try out some different Michigan brews. Not knowing how this weekend was going to turn out, we decided on just three of us: Mario (my brother-in-law), Win (my father-in-law) and myself. And we planned on trying out three courses the first day: Kalamazoo – Oshtemo Township Park, Grand Rapids – Old Farm Park, and Big Rapids – Northend Riverside Park. Then four courses the second day: Ludington – Mason County Park, Whitehall – Whitehall Township, Fremont – Branstrom Park, and Holland – Winstrom Preserve. In between these courses we were going to try hitting up some Michigan breweries and try out some local beers. This was the plan, however the execution of the plan was a little different. I think the problem was judging driving distances and playing new courses. As most disc golfers know, when you are trying a new course there are going to be issues. Issues of knowing where all of the pads and baskets are, issues of finding a disc when it was tossed into the underbrush, and issues of actually finding the course. We ran into all of these, but we learned from our mistakes. I think the plan for next year will be to start a day earlier and possibly picking courses that are closer together. Because the driving time is what killed our second day, where we only got to play two of the four courses we planned. I will now go over the first day and later this week give you the second day. 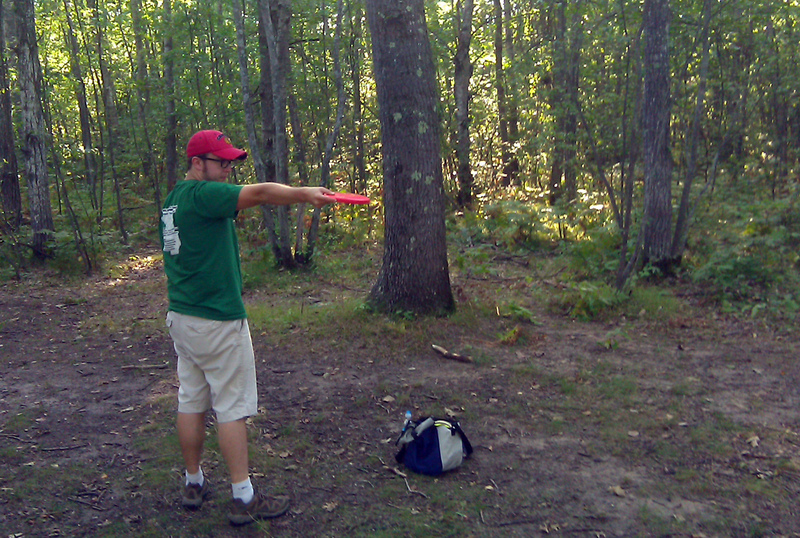 It was a great weekend for disc golf and we enjoyed every minute of it. The weather was a bit on the warm side, but we missed any of the heat by being in the car. However, there was no chance of rain and their wasn’t much wind the whole weekend. The night before our weekend was our cousin-in-law’s wedding, in which we played the important role of setting up and taking down, which meant that we had a late night and early morning. I have talked in detail about this course in the past and won’t give you any detailed description about it. I will say that it’s a great warm up for the rest of the day. 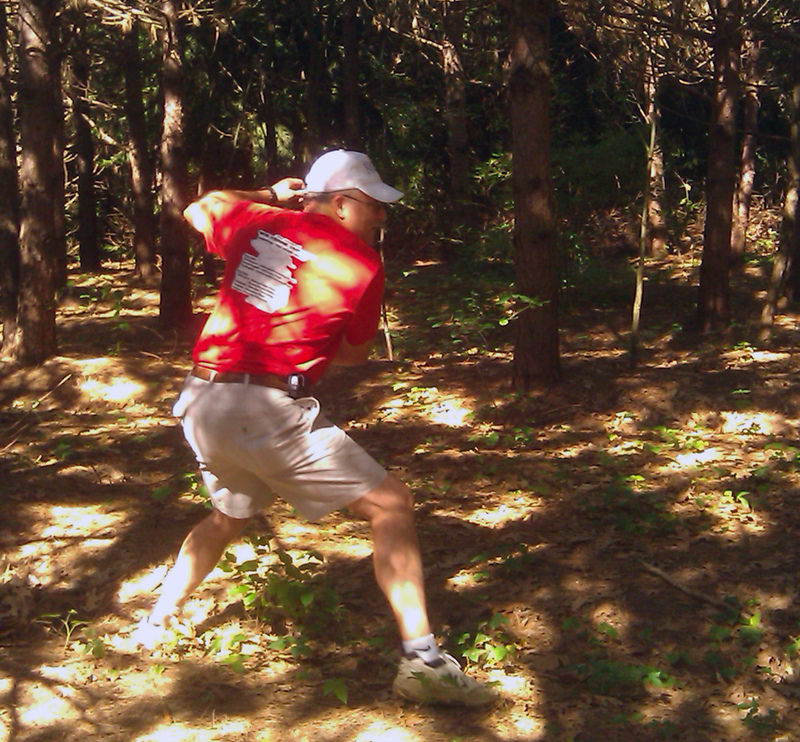 Having varied baskets, you get to practice throwing in the woods as well as long holes. Plus, going this early meant there wasn’t very many people on the course, saving us waiting time and allowing us the chance to finish up and be on our way. I had a bit of a rough morning, making glaring mistakes and having obvious throwing problems. Mario gave me an Innova Reaper to try out. This disc will naturally go left if thrown backhand, but if you hold the disc right (kinda at a 45 degree angle from the ground) you can get it to go to the right and it helps you when the course dog legs to the right. 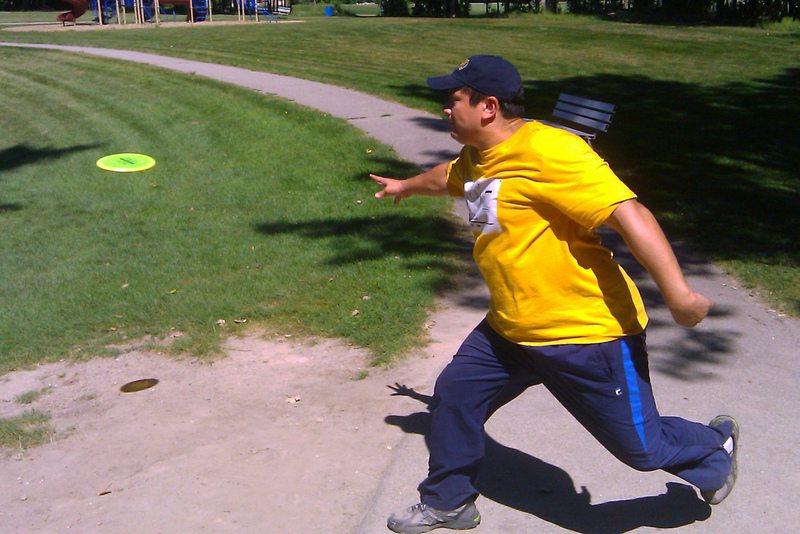 Win throwing his disc near the end of the course. Plus the disc flies fast and floats, giving you great distance. I wasn’t planning on doing anything new this weekend, I wanted to go with what I knew, so backhands and overhead throws were my norm. We did discover that to save some time we would have a spotter. Someone to run out and watch where our discs are going. 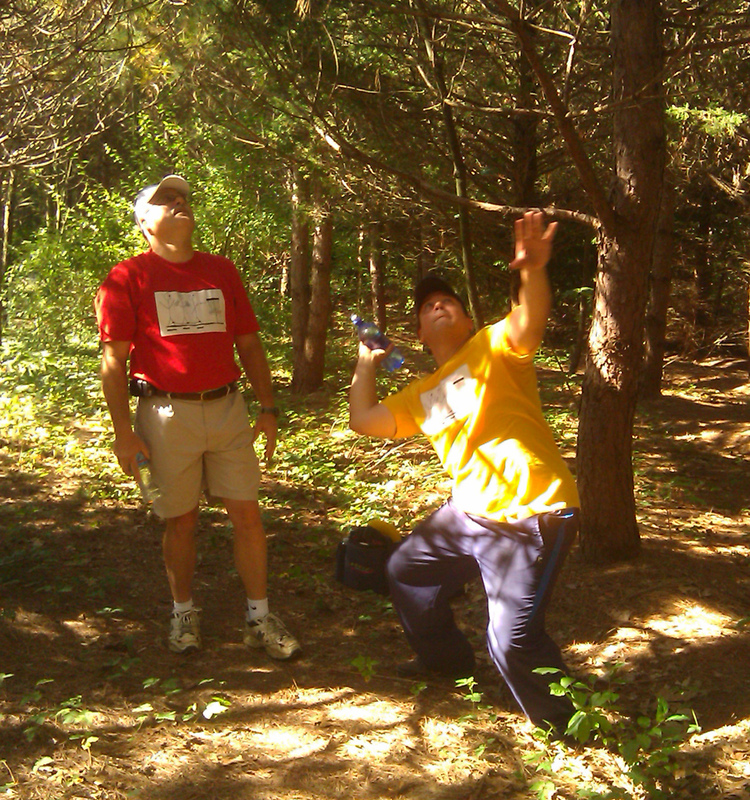 This was really helpful at Oshtemo because the trees were thick and we had some searching issues. But, once we got the spotter out there he was able to save us some hunting time. And in the end this saved us at least an half an hour. Mario sinking the putt at hole 18. After Oshtemo we drove up to Grand Rapids to get lunch at Founders and then go to Old Farm Park. Founders is a pretty amazing brewery up in Grand Rapids that I highly recommend. The sandwiches were filling and the beer great for a summer day. As we sat outside enjoying lunch our waiter noticed the shirts I made and we talked about the weekend. He suggested going to a different course, saying that Old Farm Park wasn’t very good or difficult. But, having already made the shirts, the plan was set. Sorry waiter guy. You can’t lie on a t-shirt, I think it’s a law. The plan was actually to pick a course that wasn’t hard. We wanted a somewhat easy one that we could breeze through before heading up to Big Rapids. 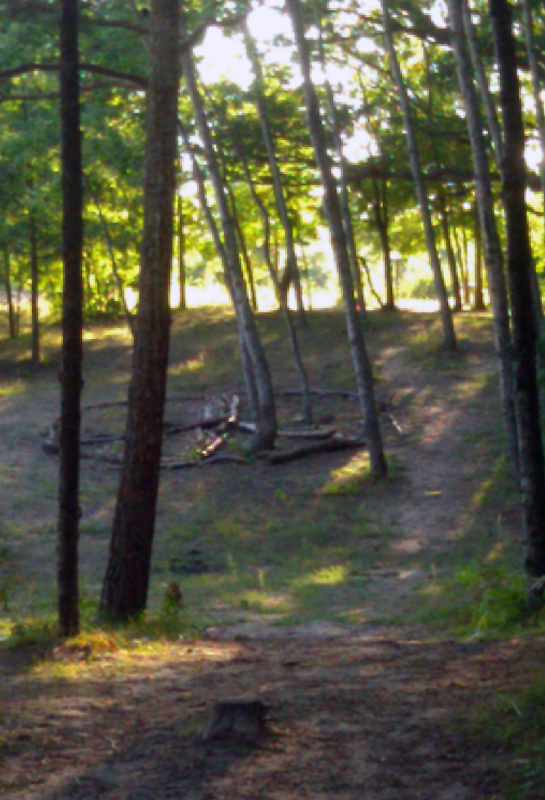 And according to the Disc Golf Michigan book, this course was exactly what we wanted. After playing the course, I can say that the book and waiter were correct. It wasn’t difficult. Most baskets were around the 200 foot mark, though not all. The nice thing was that they were clearly labeled and there wasn’t much underbrush to cause any searching issues. However, there were some water hazards, including a really nasty looking pond that I think had the Swamp Thing in there, and he would steal your discs because he liked to play at night. I had a better time at this course, though some stray moments of pain and stress. I didn’t start out strong. The first hole is deceptively easy, with a straight shot to the basket which is on a slight hill, a bump really. 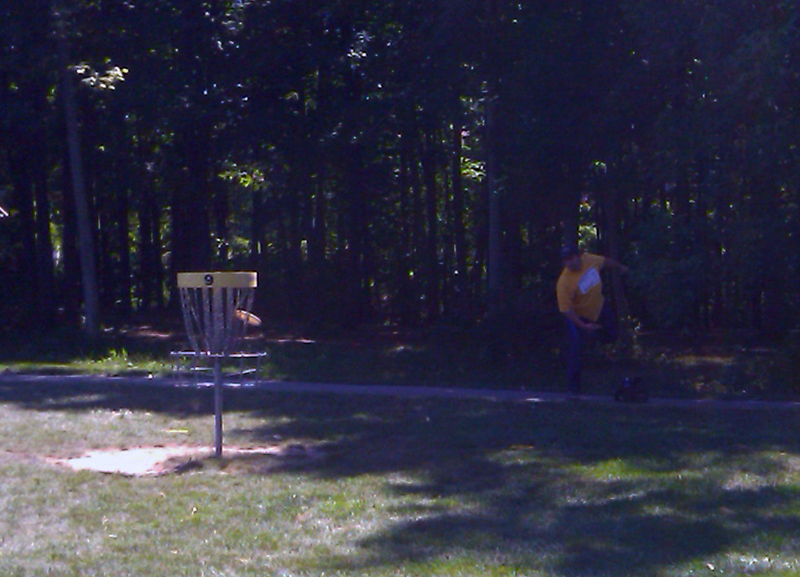 However, my disc decided to go way to the right of the basket. But, I didn’t let this slip ruin my game. The rest of the holes were pretty uneventful. They are laid out in this strip of trees in the park. I hit par on the rest of the front nine holes. The back nine had a little more challenge, with holes 10, 11, 12 and13 all in a field. This is where you could pull out some fire and have your disc fly. Which I did. Only on hole 11 my disc decided to go a little further and to the right of the basket. I was trying out the Reaper and I guess I held it at too much of an angle. But, I was still proud of the distance of the disc and I was able to make it back up. I should mention that through out all of this Mario and my father-in-law were doing great. We all stayed pretty even through out the whole course. They only had a couple of funny issues with the back nine. On hole 14 a stream was on the left and the hole was on an incline. Well, Mario had a nice throw, except his disc decided to be a roller and just couldn’t make it up the hill, and rolled right back down and into the deepest part of the stream. 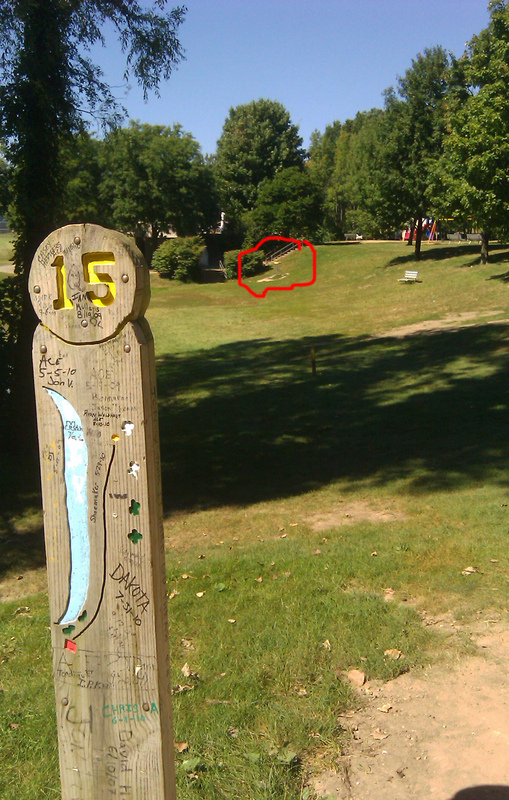 And then both Mario and Win had a perception problem with hole 15. It seemed like a simple hole, the pad was on the top of a hill, the Swamp Thing’s pond was to the right and the basket was kinda on the incline of the other side of the valley. But, from this angle you could see the basket for hole 17 on the other side of the pond. I guess they both didn’t see the basket on the hill, but they did see the basket on the other side of the pond. Both were freaking out on getting it over there. I didn’t quite understand the issue and assumed they were worried the wind would push their discs into the pond. I believe I was the first to throw and I was on target for the correct basket. Mario and Win threw, and were on the right track for the correct one, but didn’t realize it. They got up to do their second throws and both threw the disc at a really funny angle. I was totally lost at this point and asked what they were doing. I then pointed to the correct basket, which caused them to laugh and try to decide if they wanted to start that basket over again. I guess that’s what you get for looking for a challenge and not paying attention. Hole 17 did offer a bit of a problem, mainly because you were throwing to a basket that was in front of the pond (the one they thought you were suppose to throw to on the earlier basket). But, no one went into the pond. There was a couple in front of us that did make it in the pond and were trying to bargain with Swamp Thing while we finished up the course. The whole course maybe took us two hours, if that. Now we were on our way up to Big Rapids and to Northend Riverside Park. Which is about a hour north of Grand Rapids. We were making good time. We would be up to Big Rapids around five, get our hotel room, find the course, play the course and do dinner around eight. But, the heat and drive of the day was starting to wear on us. We looked pretty tired once we got to the hotel and I could feel a headache coming on. Probably not drinking enough water. After dropping our stuff off at the hotel and sitting for a minute researching where the course was and where dinner was we got back on the trail. This was Mario’s favorite course of the weekend, and I would find it difficult to disagree. Mason County Park was pretty amazing, but the one in Big Rapids had everything you could ask for and gave you just enough challenge to make it interesting the entire time. And the park ran along the Muskegon River, a beautiful river that a lot of the Ferris State University students use to go tubing. Northend River Park’s disc golf course is supposedly kept up by a disc golf pro. And it shows. Easily marked signs, clean baskets and pads, and some challenging baskets prove that somebody loves this course and uses it to prepare for big events. The front nine were in mostly open spaces with some woods around the baskets, the back nine, or what a wooden sign showed as “Anhyzer Country” was in the forest. But in a neat forest with tall tress that really only had branches in the way. We didn’t run into very many people at this course, which was fine because we did need to concentrate. The day was catching up with us and near the end of the course we were sitting on the benches waiting our turn, instead of standing watching the others throw. There was a nice breeze coming off the river and the sun was going down, keeping the temperature cool. Each basket had a unique challenge, either going up a hill or going around trees. Most of the fairways were clear. 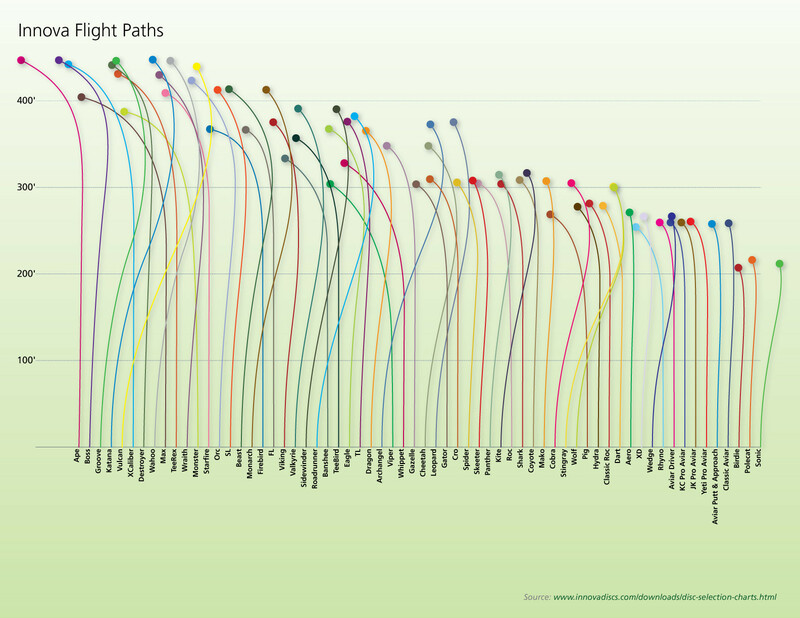 But narrow. You really wanted to throw straight on the majority of the baskets. I actually did my best game of the day here. I think it just took me a long time to warm up and knowing the day was almost done also helped. I had some powerful throws and didn’t hit many trees. Not saying that I didn’t hit any tree, I definitely left my mark on a couple of trees. But I only had one real issue, and that was overthrowing and having the disc curve the wrong way. I think I was still getting use to the Reaper and its tendency to curve. This caused a problem with the last basket. The last basket of the day was challenging because it had two huge garbage trees in the way of you and the basket. And then on the left side of the trees and basket was the road and a lot of rough. The correct way would have been to go low and easy to the right and sink a par. However, my disc decided to discover what the road was like. And it was a beautiful road, so that was nice. But, not where you want to be when you all decided to make a bet on who was going to get the car. We were soaked from sweat. And after much discussion, we decided on taking showers before going to eat. Well, I didn’t really plan on that and only packed the bare minimum. So, I had to wear some sweat boxers to dinner. But, it’s cool. I can’t smell so I was fine. Big Rapids Brewing Company is in a restaurant called the Blue Cow. The Blue Cow is a sort of a fancy restaurant. Not a required dress place, but the food was upscale. Perfect for the end of a long day. We each tried a different beer, mine was the Strong Ale, and ate some amazing chicken. After that was back to the hotel for a really tired game of Hearts and sleep. After months of almost finding a house, having it taken away, finding a new house, and again having it taken away, my wife and I have found and moved in to a new house! We have been in for a little over a month and are finally getting back into a routine. As most people know with moving, and especially with those that understand the first time owning a new home, you find yourself get a little busy. This has totally affected my disc golf playing and writing about disc golf. But don’t worry, I didn’t forget about the Wolverine Tour 2010 featuring the Chain Gang. I have photos and the posts ready. Just had a slight problem of no internet at home. So, look for the the story about the weekend in the next couple of days. While waiting for that, anyone have any stories about disc golfing during the fall?